Research in her group is devoted to computational quantum mechanical studies of materials. She addresses electronic, structural, and vibrational properties from a fundamental and inter-related perspective. She develops and applies simulation methods to investigate materials properties at high pressures and temperatures, particularly in mineral physics and geophysics, discovery of materials at ultra-high pressures, H2O-ice physics, complex oxides, and crystalline defects. 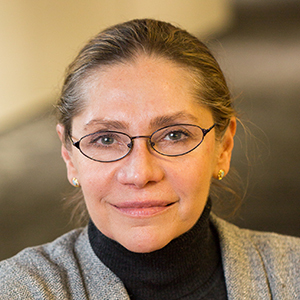 Renata M. M. Wentzcovitch is a Professor of Materials Science and Engineering in the Applied Physics and Applied Mathematics Department, Earth and Environmental Sciences, and Lamont-Doherty Earth Observatory at Columbia University. She was formerly a Professor of Materials Science and Engineering in the Department of Chemical Engineering and Materials Science at the University of Minnesota where she was a member of the graduate faculties at the in the School of Physics and Astronomy, Department of Earth Sciences, Chemical Physics Program, and Scientific Computation Program, where she was Director of Graduate Studies. Originally from Brazil, she holds a Ph.D. in Condensed Matter Physics from UC-Berkeley. She has been a regular visiting professor at the International School for Advanced Studies (SISSA), Trieste (IT) since 1998, and at Tokyo Institute of Technology since 2002. Over the past two decades her research has been focused primarily on Earth and planetary materials with special emphasis on acoustic/seismic properties of minerals including those containing iron and undergoing spin state crossovers. She is a fellow of APS, AGU, MSA, AAAS, and American Academy of Arts and Sciences. She has received the Senior US Scientist Award of Humboldt Foundation and the 2016 Wilhelm Heraeus visiting professorship from University of Frankfurt. She is currently Chair-Elect of the Division of Computational Physics of the American Physical Society.